They work in one of the toughest environments imaginable, dealing with life and death on a daily basis, and having to make split-second decisions that could change the course of numerous people’s lives. They work to strict deadlines and under intense pressure, dealing with medical, social and political dilemmas, and all while trying to deliver the best possible care to the patients in their charge. While most doctors have it tough, those in the ED (Emergency Department) have it even tougher- high demands, an often chaotic atmosphere and huge patient backlogs mean that these doctors have to be strong enough to withstand all the pressures of the job they have taken on. While some physicians thrive on the adrenaline, there are just as many who are unable to cope with the stress and understandably burn out. This collection of stories, contributed by 26 ED doctors across Australia and the South Pacific, detail some of the many emergencies that are faced daily by these special people, and the ways that they dealt with them. The list of situations is as broad and diverse as you would expect- from a worker who is crushed in a rubbish compactor, to an elderly woman suffering pneumonia. From a young woman about to give birth, to a drug-addled psychotic patient hurling abuse, to a toddler that has just been pulled unconscious from his family swimming pool. The doctors in charge have to consider everything- they need to stabilise the patient, diagnose their needs and find the best course of action in saving the person’s life. They also have to deal with the family and friends of the patient, ensuring that they are aware of the situation at hand and have adequate support available. They have to consider the patients’ requests (including their wishes regarding resuscitation and organ donation), and, due to our multicultural society, sometimes need to have interpreters on hand to be able to communicate clearly. They need to be able to lead a strong team, where everyone knows their role, and the important part they play in saving lives. While there are many tragic tales told in this book, there are just as many hopeful ones. Some of the situations that are experienced are difficult to comprehend unless you work in the medical field, and even then, some of stories defy belief. The scary thing is, these ED stories are universal. These emergencies take place in large university-based hospitals in Melbourne, small rural clinics in outback Australia and even overseas infirmaries in Papua New Guinea and Cape Town. While the natures of the emergencies may differ, and the medical facilities available to the doctors vary greatly according to health-care structure and financial aid, all of these people are dealing with trauma, pressure and life-and-death decisions. These stories allow the average reader to learn what is at stake every time these selfless people go to work, and fully appreciate their role in society. 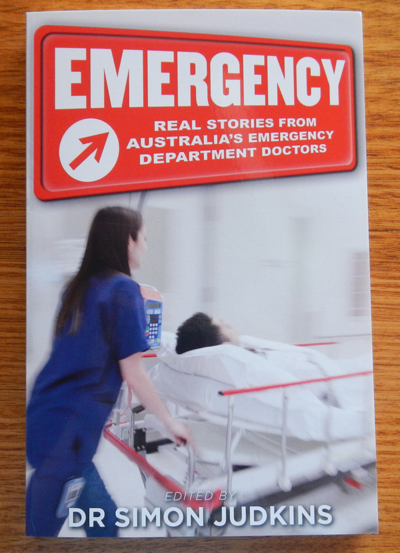 They work at a job that few people would be able to cope with (physically, emotionally and psychologically) which is all the more reason to read this book and fully appreciate the work of our unsung heroes- our emergency department staff. Furthermore, all royalties from the sale of this book go to support the work of the Australasian College for Emergency Medicine (ACEM) Foundation. If that isn’t a worthy cause, I don’t know what is.